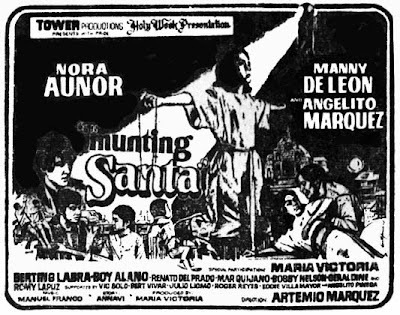 Nora Aunor made a total of 18 movies in 1970--- No doubt, her busiest and productive year (Tower Productions was credited with 11 movies, Sampaguita Pictures, Inc. with 4, JBC, FGO and Joy Productions with one each). 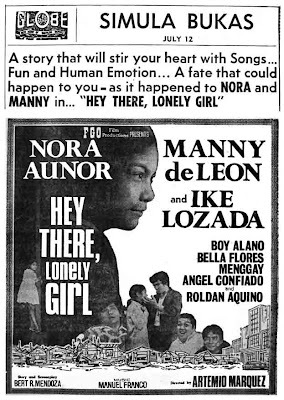 Newcomer Manny de Leon, being groomed by Tower to be the next teen idol, was Nora’s screen partner in 10 of 18 movies Nora made that year. 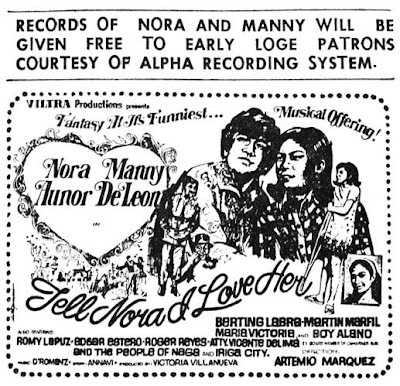 De Leon was introduced in the movie, Fiesta Extravaganza in 1969, a Nora-Tirso starrer and before the year ended, he was paired for the first time with Nora in Nora Single Girl. 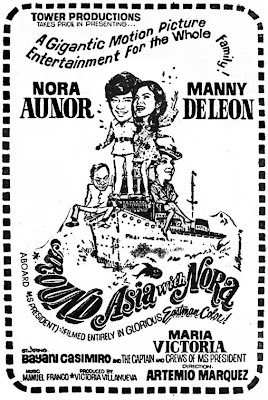 Nora started her movie career under SPI, where she was only given minor and supporting roles, and it was Tower who recognized her potentials and believed in her talents. 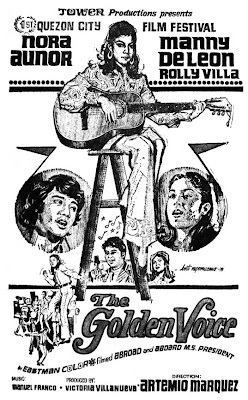 Tower executives Ms. Victoria Villanueva and director Artemio Marquez took the challenge and invested money to launch the young Bicolano girl to full stardom in D’ Musical Teenage Idols in 1969. The movie was a big box-office success. 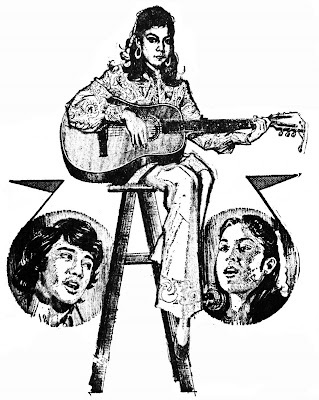 More hit movies came her way that catapulted her to greater heights. It was in 1970 that Nora was caught in a crossfire in a legal battle between her former mother studio, SPI and her new home studio, Tower as to who could legally avail of her services. The charges and counter-charges that followed proved advantageous to the young rising star for she came out the winner and become an even bigger star. 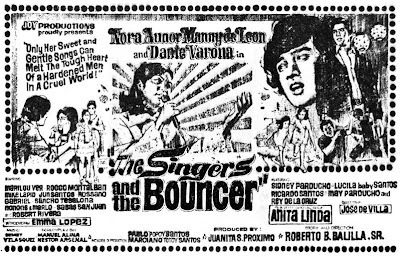 The singer and the Bouncer (1970)- Stars Nora Aunor, Manny de Leon and Dante Varona/ Directed by Roberto B. Balilla, Sr. 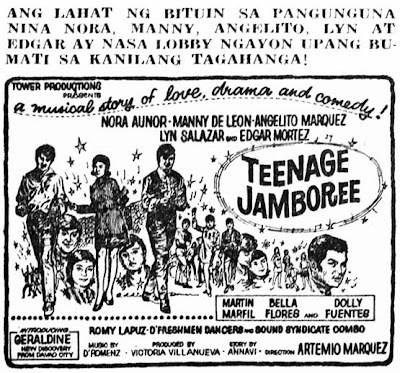 Thank you for sharing these movie ads with us. Thank you Ken! I hope the Noranians will love it. 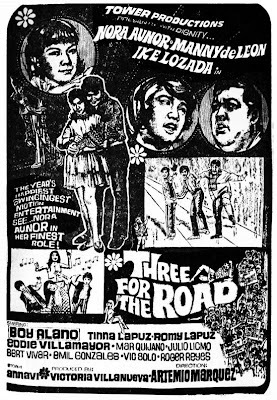 I'll be posting Nora-Tirso movies circa 70-72 next.Watch for it! Thanks ... it was in the movie "The Singer and the Bouncer" wherein Ate Guy sung " Its Time to Say Goodbye "
Zuma:the snake warrior Aztec snake king Anak ni Zuma Zuma the hero Zuma saves Christmas Zuma Lives!!! BLUTO the TERRIBLE killed KORG. Bluto friend/foe of POPEYE!!!!!!!!!! Air Force One Theme resemblance to the presidential plane used by the White House/Oval Office/commander in Chief of the United States of America inspired from 1997 action/adventure/espionage saga. Viva Espana(Long Live Spain) the national anthem of Spain a constitutional monarchy/federal parliamentary democracy under the king/queen of the Spanish people and the Kingdom of Spain/Estado de Espana/Espana capital Madrid City largest city Ciudad de Barcelona monetary unit Euro Head of State King Juan Carlis de Bourbon ruler since 1975 four decades if his leadership . capital London largest city London, Birmingham,Edinburgh and other cities monetary unit British Pound/Sterling/Euro/US dollar/Canadian dollar all others.Head of State Sovereign Queen Elizabeth II ruler since 1952 61 years of the nation. William Tel Overture/Lone Ranger theme western series!!!!!!!!!!! Smile Pinoy by Kathy Bernardo and Daniel Padilla ABS-CBN station ID. 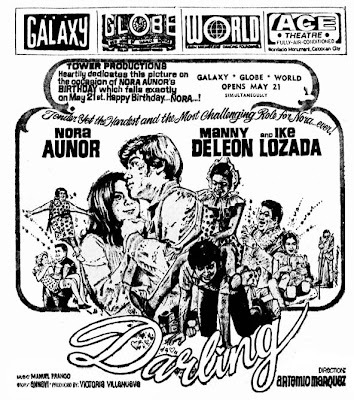 All classic Filipino films will be aired on Cinema One and ABS-CBN network as soon as possible.Thanks! 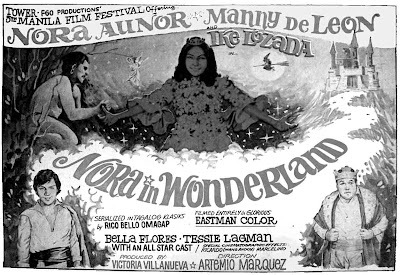 All classic Filipino films will be available on the website/Internet and order DVD/Bluray discs at EBay or Amazon.com. Thanks!